Every Sunday when we go to our local farmer's market, Kenya fervently looks forward to two things -- a pupusa with tons of cabbage slaw and a big flavored lemonade. It's so incredible for us as parents to watch how monumental this ritual is for him. Many of the central and south American food stands at the LA markets feature huge clear barrels of various naturally flavored lemonades. In addition to the tried and true original lemon version, there is also raspberry, strawberry, watermelon and various other fresh combinations, their gorgeous colors luring anyone who passes by -- as well as Kenya. As the weather gets hotter, so does our family while we shop the market, and we inevitably find ourselves wilting in the heat every summer weekend. There have already been numerous days these past two months that were so hot, shopping for food became difficult and we all started salivating as we (along with Kenya) looked at those gigantic clear vats of lemonade calling our names. I'm always more then happy to indulge Kenya with this special treat, especially considering how thirsty the rising temperatures makes us this time of year. But I also know these lemonades are made with a good deal of sugar and so when possible, I try to sway Kenya towards a nice tall bottle of water, so we can make homemade strawberr-wee lemonade with our food purchases from the market when we get home. As soon as the produce is unpacked, Kenya is up at the counter rolling the lemons (one of his favorite kitchen jobs because he knows that's the best way to release the juice). 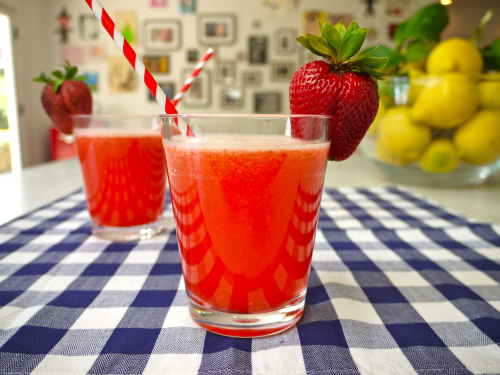 With just a rinse of the berries, a touch of natural sweetener, a quick puree and a brisk stir, our healthy lemonade is ready for us to gulp down and enjoy! 1. Puree strawberries and honey (or agave) in a blender or food processor until smooth and transfer to a pitcher. 2. Pour the strawberry mixture, water and lemon juice in a pitcher and stir to combine. 3. Chill and serve over ice. Ohhhhh this looks wonderful. I will be making this for Cole tonight for after dinner coolness. I bet it's wonderful. I just made this and it is so refreshing! I bet it would also make great home-made popsicles. This tasted so good. Such a refreshing treat for the summer! Cole was more into his milk tonight but Mom and Dad sure enjoyed. I just love that everything is fresh. How great is that!? please be warned: this recipe contains far too much agave nectar than is considered safe. Just keep your overall fructose usage below 25 grams per day, agave syrup included. One teaspoon of agave syrup has 4 grams of fructose. This recipe calls for a 1/4 cup agave, which is equal to 12 (yes, 12!) teaspoons, and contains 4 servings. So, each serving contains 3 teaspoons agave, which is equal to 12 grams of fructose (i.e. half your RDA), not to mention the naturally-occurring fructose in the strawberries and lemon. So, let's not kid ourselves that using agave nectar as a sweetener is any better than simple refined white sugar- the truth is that it is actually WORSE. Better to use stevia if you are really after a low sugar substitute. Or just less 'real' sugar. NYCMama, thank you for your thoughts. I too have read Dr Mercola's articles on agave. I've done a TON of research, talked to Doctors, chefs, nutritionist, etc..and here's what I'm recommending and living by with my family. When it comes to sugars, everything in moderation. I wish that agave was a true \"get out of jail free card\". Most of the sweet recipes online and in cookbooks use white and brown sugar, so I try to use different sweeteners like agave, rice syrup, honey, etc.. in my recipes to offer a choice. I love agave for it's neutral flavor, smooth texture and sweet taste. We use agave in our house, but sometimes we want a traditional cookie with sugar or white cupcakes which can't be made with anything, but white sugar (I made mini cupcakes for Chloe's birthday yesterday). I tested them with different type of sweeteners, but they just weren't any good. When I make lemonade, I use agave. It's just about finding that balance. One of my chef friends who owns a restaurant that serves 80% of the food from his farm said that there's a council for everything. The dairy council, the sugar council, meat etc... There are articles saying that agave is the best thing in the world and others that say it's the worst. This again goes back to balance! How much do you consider to be a serving anyway? Our youngsters are not drinking all that much so I consider this to be a safe alternative to sugars. My husband and our 3 1/2 year old daughters just made this together. It is the *best* lemonade I've ever tasted, a little sweet, a little tart and smooth. Thank you! Do you know approximately how many lemons it takes to get 1/2c of lemon juice? It really depends on the size and juiciness of your lemons, but I would estimate 3. Excellent! I used frozen strawberries and honey. Will be making this again for sure..... It would be really fun at a kids party because of it's beautiful bright colour! My kids loved it - Thanks! We were out of strawberries so we subbed in frozen black cherries. delish! Can you replace the honey with sugar? Yes you can! You can also use agave. Can you replace the honey with maple syrup? That will create a different flavor, but yes you can definitely use maple syrup instead of honey! After 12years of marriage, me and my husband has been into one quarrel or the other until he finally left me and moved to California to be with another woman. I felt my life was over and my kids thought they would never see their father again. i tried to be strong just for the kids but i could not control the pains that torments my heart, my heart was filled with sorrows and pains because i was really in love with my husband. Every day and night i think of him and always wish he could come back to me, I was really worried and i needed help, so i searched for help online and I came across a website that suggested that Dr Unity can help get ex back fast. So, I felt I should give him a try. I contacted him and he told me what to do and i did it then he did a Love spell for me. 28 hours later, my husband really called me and told me that he miss me and the kids so much, So Amazing!! So that was how he came back that same day,with lots of love and joy,and he apologized for his mistake,and for the pain he caused me and the kids. Then from that day,our Marriage was now stronger than how it were before, All thanks to Dr Unity. he is so powerful and i decided to share my story on the internet that Dr.Unity is real spell caster who i will always pray to live long to help his children in the time of trouble, if you are here and you need your ex lover back or save your marriage fast. Do not cry anymore, contact this powerful spell caster Dr.Unity now. Here’s his contact: Call/WhatsApp him: +2348071622464 ,Email him at: [email protected] , Website:https://unityspellstemple.blogspot.com ,Your kindness will never be forgotten.